Did Harry Have a Right to Know What Dumbledore Knew (or Suspected)? In response to a previous post, aspenlinmer drew an interesting comparison between the revulsion that both Harry and Snape feel or display when doing what Dumbledore commanded of them in book six. Their remarkably similar reactions differ only in that Harry directs his hatred inward while Snape projects it onto Dumbledore. This brings to mind some important questions: Why didn’t Harry resent Dumbledore for asking him to do terrible things without explanation? Why does Snape seem to hate Dumbledore even as he obeys him? Is it just because Dumbledore was in charge? Or is it because Dumbledore serves as the ultimate puppeteer, moving all his puppets along his course of events while not really knowing all the answers? One must ask if Dumbledore really cares about the puppets he blithely controls; or does he care only for the game he’s playing with Voldemort? Has Dumbledore reverted back to his earlier construct, “for the greater good”? Is his sacrifice of those around him justified in his quest to defeat Voldemort? And should Harry have a say in all of this? Perhaps the most interesting and difficult ethical discussion derived from the Potter series is the issue of Harry’s self-determination and consent due to Dumbledore’s decision to withhold information. This seems to be a repetitive theme. One several occasions Dumbledore, at the end of a book, provides Harry important information – often in conjunction with an apology for not telling him earlier. 9) Harry was able to get the stone out of the mirror because he wanted to find it but not use it (300). But what Dumbledore doesn’t reveal is just as important if not more important than what he does. To explain his secrecy he declares that “the truth is a beautiful and terrible thing, and should therefore be treated with much caution” (298). He adds, “I shall answer your questions unless I have a very good reason not to” (298). Most importantly, Dumbledore cannot tell Harry why Voldemort wanted to kill Harry in the first place – “Not today. Not now. You will know, one day . . . put it from your mind for now, Harry. When you are older . . . when you are ready, you will know” (299). Let us also remember that by this time, Dumbledore knows that “either must die at the hands of the other for neither can live while the other survives.” (OP 841). On the next post, we will delve into what Harry is told in the next few books, as Harry gets older and in theory more deserving of learning the full truth. 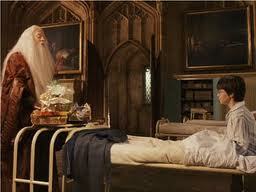 As we proceed, we must ask ourselves at each conjuncture, just as Dumbledore did: Can a boy this age handle the truth? Can this particular child deal with what appears to be his destiny? And then I will tie this all into The Art of Spying: How much do we tell our spies in the field? Do they understand the need not to know everything? What ethically must they know about the mission, the risks, the importance, and the reason for the mission? Is it an issue of self-autonomy? Plausible deniability? Or simply preventing information getting to the other side if they are captured?